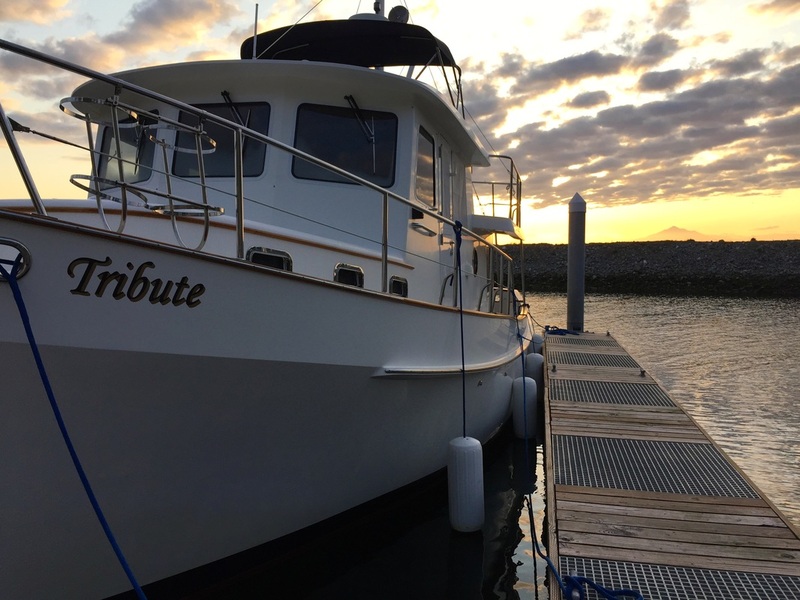 Tribute is a 2004 Kadey Krogen, 39 foot pilothouse and is hull 43. About 50 hulls of this model were produced from the late 1990's until about 2008. We found her on Lake Union in Seattle and was named Sisu. Our broker, Kory Scott of Northwest Yachts suggested that we look at this model and though we knew of the Kadey Krogen 39 and had walked on them at the Seattle Boat Show, we had not considered this as our next boat. I immediately knew that this would be our next boat when Laurie walked on, took a quick look around and immediately gave me that signal that meant the shopping was all over: two thumbs up and an ear-to-ear grin. The boat was re-named and christened to recognize and honor the family, friends, blessings and other circumstances that made this opportunity happen for us. John grew up in San Diego and learned to sail in an 8-foot long Sabot at the San Diego Yacht Club before that club was cool to be a part of.. We had two sailboats at the marina in Everett, Washington for 10 years, had a Bayliner 24 foot cruiser for 10 years on a trailer at their house and then owned two Ranger Tugs for a combination of 9 years. The Laurie Ann was a Ranger 25, CLICK HERE to see the website that describes the adventures this great tug took us on. 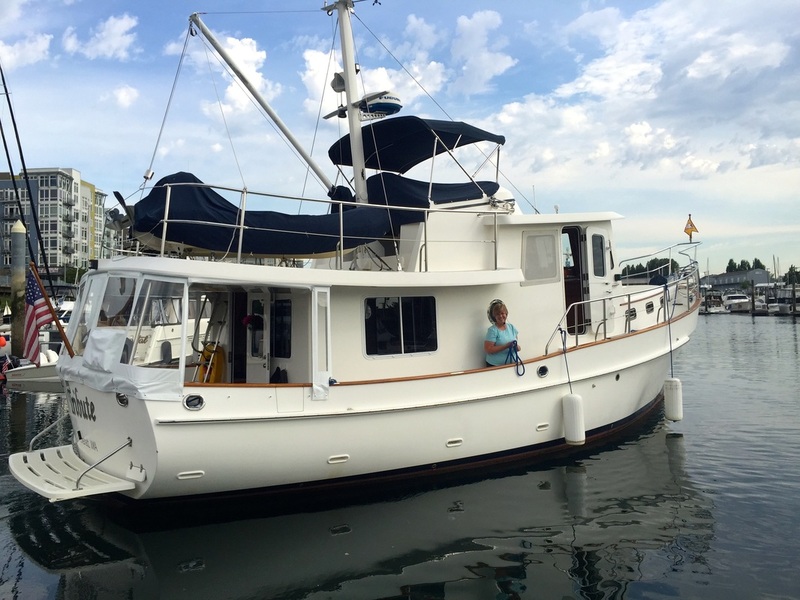 Inspired from experiencing a portion of the Great Loop, we bought Andiamo, a Ranger 29 tug, and took that fabulous boat on the 6,000 mile adventure from Florida, to the Great Lakes, to Chicago and down the inland river system to the Gulf of Mexico. CLICK HERE to see photos and excerpts from our journal. That 10-month long adventure hooked on us the notion of living a larger portion of our lives on a boat but Andiamo was not large enough. ​We live in central Puget Sound and call Everett, Washington our homeport. We have retired from one chapter of full-time work and are working part-time in another chapter. We intend to divide our lifestyle between Tribute, our Ranger Tug 27 "Trilogy" that is kept on its trailer east of the Mississippi River, a house on Hat Island (formally called Gidney Island) and our 21 foot long Escape Trailer. Our adventures on Trilogy, a Ranger 27 Tug is on a separate page: Trilogy, Our Other Boat. We keep this boat on a trailer and cruise the eastern United States and Canada by driving or flying from Seattle, renting a truck for the launch and then cruising for weeks. See the page or click HERE for photos and text of Florida, the Tennessee River, and the historic canals of Canada and New York State. The Inside Passage, is a trip from Seattle to Glacier Bay National Park in SE Alaska that included British Columbia is chronicled in photos and text on the pages the follow by sections of the trip and back, and are labeled BC-AK. ​ Click HERE for the first page of preparing for this 93 day long trip of amazing scenery and wildlife and the lessons learned along the way. The additional pages are intended to share our lessons, what has worked for us, and some of the adventures that Tribute​ has taken us. If you would like to contact us and send a comment, please use the "Contact Us" page. The design uses elements of the flags of Alaska, British Columbia and Washington. It is made of two layers of durable nylon, and digitally dyed on both sides. The burgee is for sale on Amazon.com Simply, search for Inside Passage Flag or click ​HERE​ to take you to the page.